In saltmarshes, there is always something worth looking out for. I have written about one such plant, the Silky Wilsonia (Wilsonia humilis) in a previous post. When I went for a walk on the 11th of April 2009 at South Arm, Calverts Lagoon, I was delighted to find another rare saltmarsh plant, the Golden Dodder (Cuscuta tasmanica), which occurs in only a couple of other localities in east and northeast Tasmania (See DPIW’s listing statement). Golden Dodder hails from the morning glory family (Convolvulaceae), or so it will be revealed upon examining the flowers. I revisted the lagoon when the Golden Dodder was flowering in December the same year just to convince myself of that. I can’t say I am extremely convinced as the plant does seem to be very different looking from other members of the morning glory family. Molecular work however does seem to support the placement of Cuscuta within the morning glory family (Stefanovic et al. 2003). Some botanists consider the genus Cuscuta to belong under it’s own family, the Cuscutaceae. Disposition-wise however, the Golden Dodder is far from the blooms that glorifies the morn. The Golden Dodder is a parasitic plant of the first grade. Plants such as the Golden Dodder are called holoparasites, that is to say they do not have functional apparatus for photosynthesis and thus rely entirely on their host for food. Moreover, the Golden Dodder and other members of the Cuscuta genus lack internal phloem, the conducting vessels that transfer food within the plant. The Golden Dodder thus relies on specialized root-like outgrowths called haustoria which penetrate into the tissues of their host. Talk about a botanical vampire. I’d call the Golden Dodder the saltmarsh ‘gory’. The foreboding recognizability of the Golden Dodder precedes its parasitic nature. Despite having no obvious leaves, this plant is immediately recognizable, even from a distance. In a patch of uniformly green saltmarsh herbs, the Golden Dodder stands out like a blazing orange plague. When my gaze first fell upon those bright orange chlorophyll-lacking stem threads, the first word that flashed in my head was ‘Pestilence’. Too strong a word perhaps, but pestilent or not, the form of the Golden Dodder and their place in this unique ecosystem piqued my natural curiosity. I wondered what role these plants play in the ecology of the salt marsh. The salt marsh is, on its own, a physiologically harsh environment for plants. Salinity has driven various unrelated families to resort to succulence, that is to say, using stored water in their succulent leaves to dilute the salt taken up from the soil. 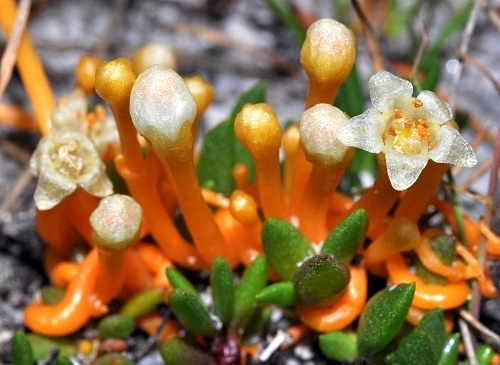 A number of plants like of Sarcocornia (Glassworts), Disphyma (Pigface) and Spergularia (Seaspurrey) among others, have found succulence to be a viable means of dealing with salt and has thus come to dominate the saltmarshes. From a scientific perspective, a number of interesting studies that may be undertaken. For instance, the host plants themselves probably have very concentrated sap by conventional standards. What does this then say about the the physiological mechanisms of the Golden Dodder? How does it deal with salt, if it absorbs any from its host? Interestingly and perhaps incidentally, the preferred host of the Golden Dodder is the Narrowleaf Wilsonia (Wilsonia backhousei), another member of the Morning Glory family. Some family feuding going on? Much still to learn of these wonderful plants in this wondrous natural environment. This entry was posted in Rambles, Threatened Plants and tagged Calverts Lagoon, Convolvulaceae, Cuscuta, Cuscuta tasmanica, Cuscutaceae, Golden Dodder, holoparasitic plants, morning glory family, parasitic plants, salt marsh, saltmarsh, South Arm, Threatened Plants, Wilsonia backhousei. Bookmark the permalink. We have the Golden Dodder living at our lagoon on Tamarix Road at Primrose Sands. Have you noticed the very strong similarity between the flowers of the Wilsonia and the Cuscuta? I have a photo of the two side by side and wondered if there may be something going on in relation to attracting pollinators. Another interesting point, which is illustrated in your 2nd photo above is the apparent self-destructive nature of this parasite. Presumably an individual Cuscuta spreads outwards in a circle from where it initially germinates. After some time it appears to kill its host in the centre where it has been longest established. It then appears as a doughnut shape with a dead interior(devoid of wilsonia), ever expanding. The parasite is almost tumour like! But it does also have a certain charm, don’t you think? Hi Oliver, are you the Oliver I know from our BSc days? If you are, it’s been some time! Great to hear from you! I never noticed actually that the flowers of Cuscuta and Wilsonia are similar as I actually haven’t seen them flowering at the same time. But I wouldn’t to surprised given that the two are actually from the same family! I certainly think that Cuscuta is one most striking plant and like your tumour analogy, and I think that Cuscuta must be quite “virulent”. What keeps it in control must surely make for a good little study project. As does the question of whether they compete for pollinators. Yes you remember correctly, It has been some time! It’s a great site you have here, I wish I had more time to look over it. If I can find my photo of them flowering together I’ll send it to you. I have actually only seen Cuscuta once and it was in October 2007 at Calverts Lagoon. Perhaps every timne the lagoon becomes inundated the Cucuta dies out? I wonder how it re-establishes itself. I believe James Wood did some germination trials at the RTBG and I did see one of his tiny seedlings that they were attempting to attach to a host, but I am not sure how that went.